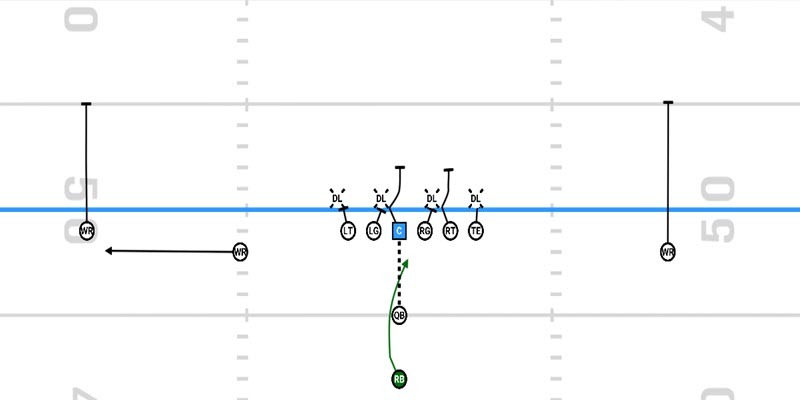 The Inside Zone has been a play utilized by the Oregon Ducks’ offense for quite some time. Chip Kelly predominantly ran the play from the Shotgun, while Coach Mario Cristobal leaned a little more in the direction of the Pistol. Today we’re going to take a look at how the play works and how it is run differently from both formations. 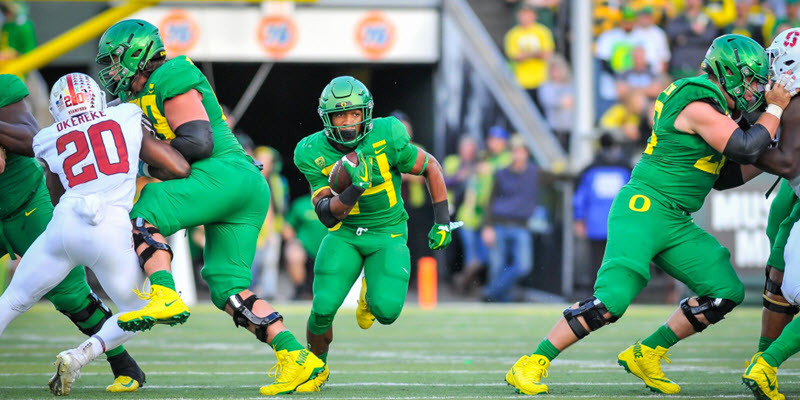 During the Kelly-Helfrich era of Oregon football, the Inside Zone was often seen coming out of the Shotgun. In the scheme, the running back would take the handoff, crossing the face of the QB, and attack the playside A-gap. The A-gap is the space between the Center and the Guard on either side of the formation. As you can see in motion above, the Inside Zone is attacking the side of the defensive line where the 3-technique is aligned. The 3-technique is the defensive lineman that aligns himself in an outside shade over the offensive guard. Attacking this side allows for a better angle through the A-gap. The blocking scheme is a simple zone blocking scheme. All of the offensive lineman are going to target the playside number or shoulder of the defensive linemen. Uncovered OL will help the covered OL with double teams before peeling off to the second-level defenders. Then there is the Inside Zone from the Pistol. 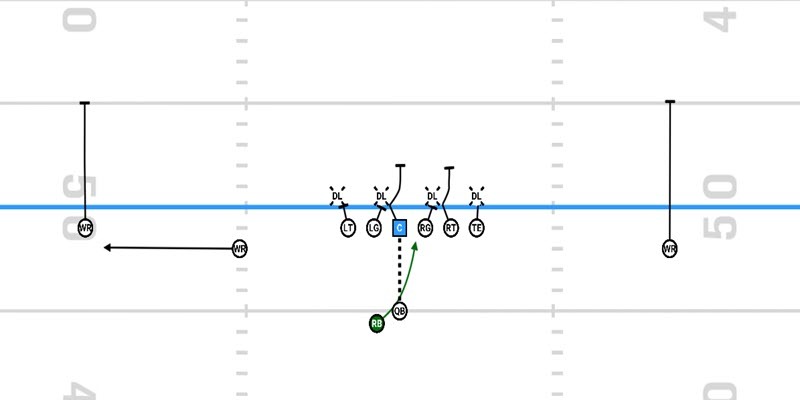 In fact, there are two different methods of running this play from the Pistol. The first of the methods kind of mimics the same method of the Inside Zone from the Shotgun. 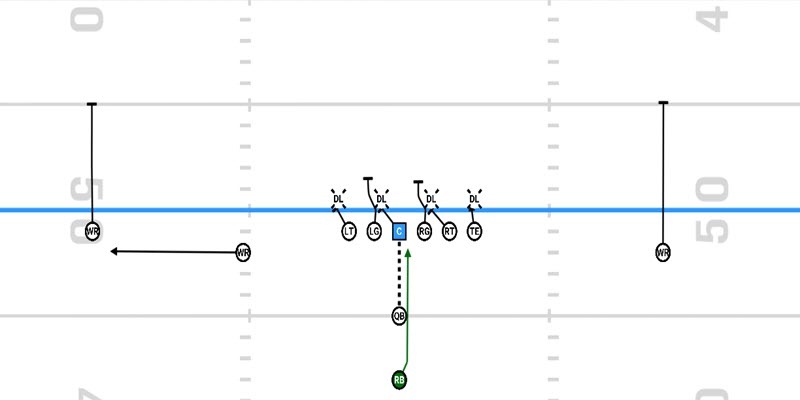 In this scheme, the running back is still going to attack the playside A-gap, and the side of the 3-technique. At the snap, the RB takes his lateral step before coming downhill and then crossing the QB’s face at the mesh point. Because he’s crossing at the mesh, all of his cutback lanes will essentially be the same as if he were running the play from the shotgun. The second method for running the Inside Zone out of the Pistol is one that attacks the backside A-gap, still focusing on the 3-technique most often. As you can see, I say that this method attacks the backside because of the blocking. The zone blocking here is going to the left and the running back is coming straight downhill to attack the right side A-gap. This method allows the RB to come downhill right from the start, but it kind of limits the type of cutback lanes the RB has at his disposal. I’m not 100% sure which of the two methods from the Pistol the Ducks prefer, but through watching game footage, it seems as though they switch between the two. The use of all three of these methods helps to keep things a bit fresh with the Inside Zone.